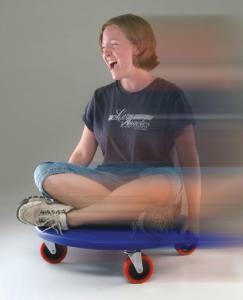 Students learn about Newton's laws with a fun science ride on this inertia scooter. This device uses smooth-coasting wheels to act as a dynamics cart that students can ride. It works as a exciting substitute for dynamics tracks and motion experiments to engage your students in hands-on learning. It features a large platform and recessed handles to protect hands.